Foodies and non-foodies alike are falling in love with Peruvian cuisine, from Miami to Seattle and everywhere in between. Foodies and non-foodies alike are falling in love with Peruvian cuisine, from Miami to Seattle and everywhere in between. Renowned Peruvian chefs like Gastón Acurio from San Francisco’s La Mar and Erik Ramirez from New York City’s Raymi’s are elevating the status of Peruvian cuisine and its unique ingredients internationally. Diversity Peruvian cuisine is a reflection of the many cultures and ethnic backgrounds that make up the South American nation. The incomparable cuisine is a blend of influences from the indigenous population like the Incas, as well as cuisines brought in by immigrants from Europe, Asia and West Africa. Each of the 25 geopolitical regions of Peru bring something special to the table that is unique to their own region. For example, the very popular rocoto peppers are native to the Arequipa region of Peru, located in the southern part of the nation. Ceviche Ceviche, which Peruvians proudly claim to be indigenous to Peru, is at the heart of its cuisine. 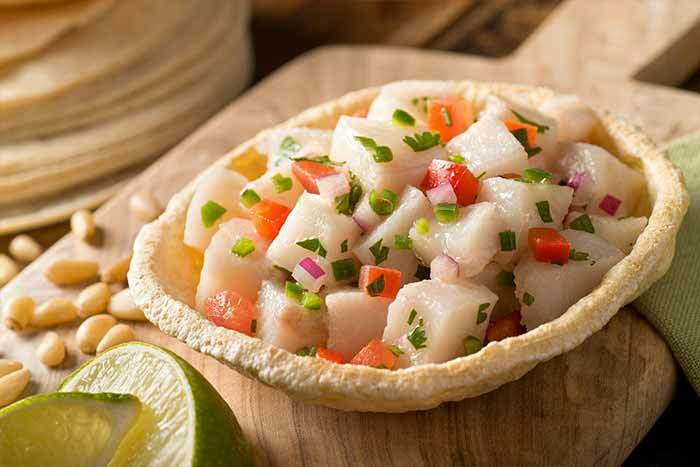 While the base of ceviche typically involves raw seafood marinated and “cooked” in fresh lime juice, Peruvians have managed to create hundreds of delicious versions of ceviche using regional ingredients, including flavorful fruits and vegetables. These carefully refined and executed works of art have become synonymous with Peru’s haute cuisine, or rather, alta cocina. Potatoes, Potatoes and More Potatoes No other place in the world can boast to a wider variety of potatoes than Peru. Potatoes originated in the Andean highlands of Peru, which has over 4,000 different kinds of potatoes and potato-like tuberous roots. The extensive variety of potatoes and roots includes a wide range of colors, sizes and flavors—a gastronomic heaven for chefs looking for diversity in dishes. Among the most common are the camote or boniato, which is popular because of its mild and sweet taste. Also very popular is the papa púrpura, deep purple in color, but similar to a traditional potato in taste. Creative Proteins One will never be bored with Peruvian food. Curious and tasty sources of protein such as anticucho, alpaca and cuy are staples in different regions of Peru. Anticucho, a popular snack and appetizer available on most Peruvian menus, is a popular kabob typically made with seasoned hearts of beef. Alpaca is a smaller type of llama, ubiquitous in the Peruvian Andes and a source of meat for Peruvians for hundreds of years. More unusual is the cuy, similar to a guinea pig, and an important source of protein particularly in rural areas of Peru. A Rainbow of Peppers Peruvians are blessed with over 300 varieties of hot and sweet peppers, so they are used regularly in cooking for both color and flavor. Among the most common is the aji amarillo pepper, a green chili pepper that turns orange as it matures and has a fruity taste and a medium to hot flavor. Also popular is the aji rocoto, a smaller version of a bell pepper. Like a bell pepper, they can be harvested at different levels of maturity, which affects their green, yellow or red color, and can be served stuffed as a main course, used in sauces and pastes, or as an ingredient in soups and other dishes. Another increasingly popular and newly-commercialized chili pepper is the Inca red drop pepperwith an exceptional taste that is bittersweet and a little spicy. These small, tear-shaped peppers originated in the Peruvian Amazon. With so many interesting flavors, colors and cultural history, it is no wonder that many people adore Peruvian cuisine. Want to fall in love with Peru, too? Highly recommended restaurants from around the country include: Miami’s Doctor Limon from Chef Carlos Brescia; Sarasota, Florida’s Darwin’s on 4th, from chef Darwin Santa Maria; Springfield, Missouri’s Café Cusco for a more casual ambiance; Chicago’s Tanta, from chef Gastón Acurio; New York’s Panca, from chef Emmanuel Piqueras; and Los Angeles’ Los Balcones del Peru from the Rodriguez Brothers. Visit us on Facebook and let us know your favorite Peruvian eateries.